BOGOTÁ, COLOMBIA (15 Aug/2013)-the leader of the guerrillas of the FARC, Timoleón Jiménez, "Timochenko", said that the threat of Colombian President Juan Manuel Santos to give low (kill him) if the army finds it harms the peace process. "The death threats and the orders of execution without any kind of trial do not serve to intimidate us, nor do they help to build the atmosphere of reconciliation necessary to find an exit," said the insurgent leader in a letter published on Thursday by the revolutionary armed forces of Colombia (FARC) on its internet site. 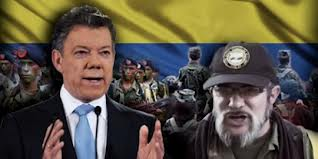 "Timockenko" referred to the statements of the previous week of the Colombian President, in which he said that if the official troops found the hideout of the FARC's maximum leader, the order was to kill him. Juan Manuel Santos recalled that his Government and the insurgent group agreed to talk without a previous ceasefire, which is held by the military offensive to find its members, including its Chief Commander. The parties began in November dialogues for peace in Havana to end half a century of internal armed conflict in Colombia, with Cuba and Norway as guarantors and Chile and Venezuela as countries companions. In the message, Jimenez attributed the difficulties to achieve agreements in the roundtable dialogue "to the public confessions of Saints", according to which he does not negotiated fundamental aspects in the system of Government or economic matters. "Timockenko" stressed that the FARC has informed that the armed struggle is demanding changes in economic policies which as they believe benefit foreign companies and exclusionary political system governing Colombia. International Forum "Ingineers of the Future - 2013"